With Avengers: Endgame less than a month away, Marvel is anticipating the likely box-office smash by showing off their new line of toys celebrating the 23rd film in the increasingly massive MCU. You can check them out in the gallery below! First up, Diamond Select has Ant-Man, Iron Man MK85, and a deluxe Hulk will start things off with the nine-inch-scale Marvel Movie Gallery Avengers: Endgame PVC Diorama line. Ant-Man and Iron Man have a suggested retail price of $49.99, where the oversized Hulk will run around $69.99. Additionally, the Marvel Movie Premiere Collection will expand to include versions of Black Widow and Captain America in their most well-known movie costumes. Both stand about a foot tall and cost around $150, but are limited to 3,000 pieces, so act fast. 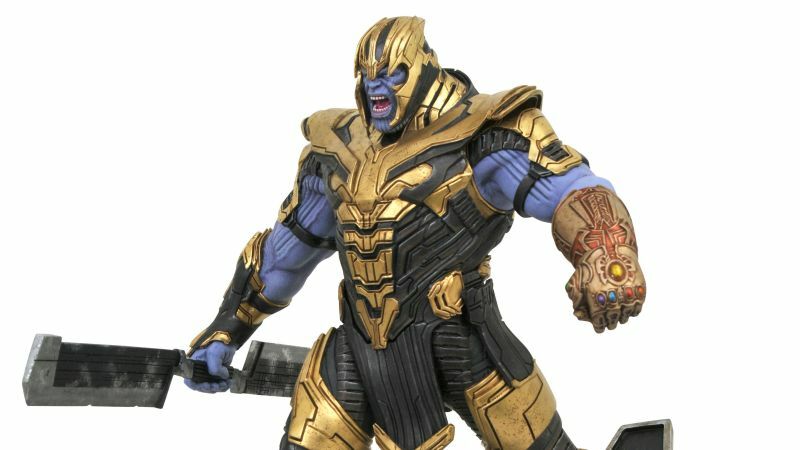 There’s also Thanos, whose statue will top out at 16-inches tall, and is limited to just 1,000 pieces and will sell for roughly $500. For those looking for a cheaper, smaller option, there’s Diamond Select’s two-inch-tall MiniMate line. This $24.99 collection includes Tony Stark, Black Widow, Hulk, and War Machine in their new team suits. It also comes with swap-out heads of Ant-Man, Scott Lang, Clint Barton, and Nebula to make the most of the new Endgame costumes — and your shelf space. Finally, the official LEGO sets for the film have been revealed, including an over-sized War Machine set and an attack on the Avengers compound by Thanos himself.